The Casio company takes its name from its founder, Tadao Kashio, who established a small mechanical manufacturing business in Tokyo in 1946. During the early 1950s Kashio and his three brothers developed an electro-mechanical calculating machine based on telephone relay technology. The machine used over 300 relays and weighed 140kg, but was apparently quite successful. 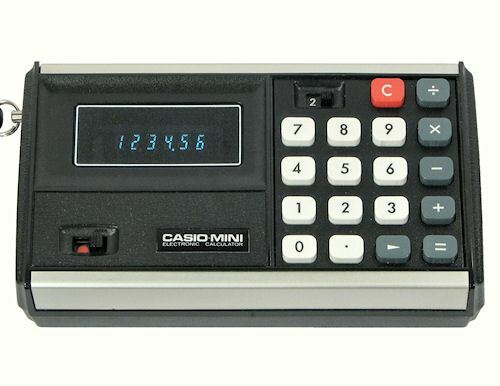 The Casio Computer Company was established in 1957 to develop and manufacture the relay-driven calculators. Casio produced (and continues to produce) a huge range of calculators. In 1988, for example, their annual catalog ran to 43 pages and contained almost 200 different models. 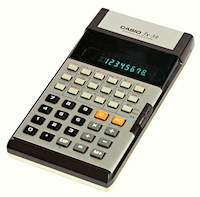 The calculators described here are only a very small selection, arranged more or less in chronological order to show the progress in technology. Click on the photos for larger illustrations, or follow the links for further information. Casio's first electronic calculator (the Model 001) was released in September 1965, and was updated the following year to become the Model 101. 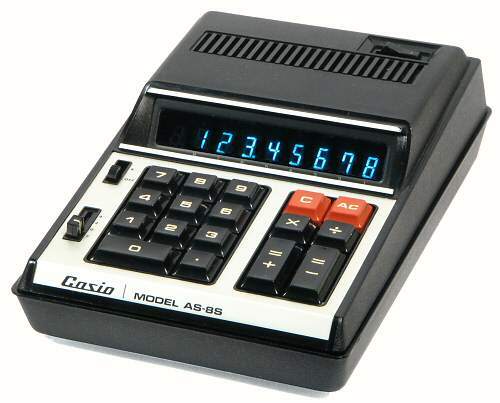 Casio's first export shipment was made in September 1966, when a consignment of Model 101 calculators was sent to Australia. 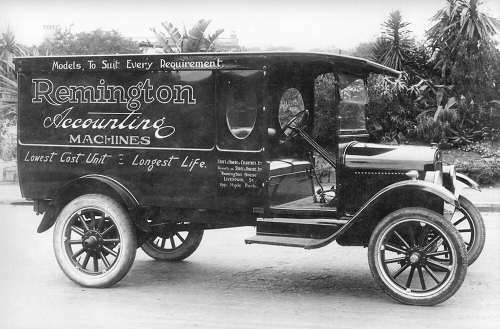 The machines carried a small "Remington" badge and were sold through the long-established Remington dealerships. The Casio 101 was priced at $1670, which was about 50% more expensive than a top-of-the-line fully-automatic mechanical calculator. The Casio 101 is a very capable machine, considering the state of development at the time. The display is normally right-aligned with leading zeros, and has a backspace key to correct errors. A six-digit constant factor with a decimal point can be set on the seven front-panel dials and accessed with the K key. The leftmost dial sets the display for 0 to 9 decimal places. The single memory register can be accessed directly with the M and F keys, or it can be set for automatic accumulation of products with the Σ (sigma) key. A red = (equals) key subtracts the product, or displays the complement of the last result. The FA key left-aligns the display for division and for double-precision multiplication. 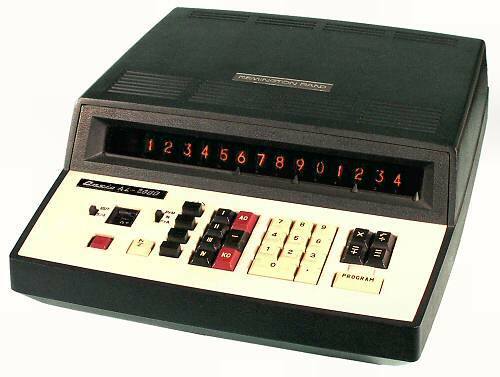 The machine will multiply two 10-digit numbers to produce a 20-digit result, with the least significant digits returned in the memory register. The internal view shows a heavy sheet-metal card cage containing 9 logic boards, each measuring 310 x 180mm. 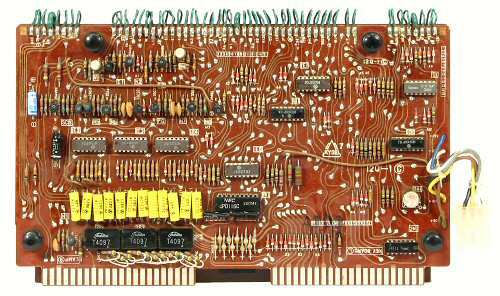 The boards are said to contain over 10,000 discrete components. The display board with 10 NEC Nixie-style tubes is mounted at the front of the card cage. The keyboard frame is a heavy metal die-casting, with the power supply mounted underneath. The moulded plastic casing (about 6mm thick) has a removable panel in the base to give access to the hand-wired backplane. 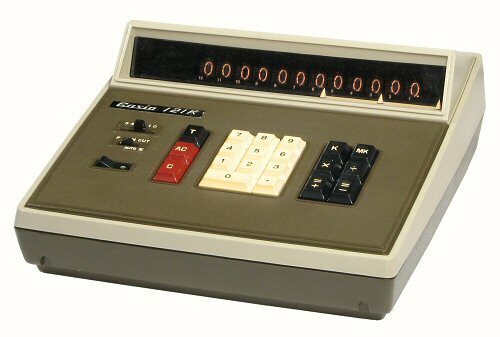 The AL-2000 programmable desk calculator was introduced in November 1969 as a successor to the AL-1000 machine. 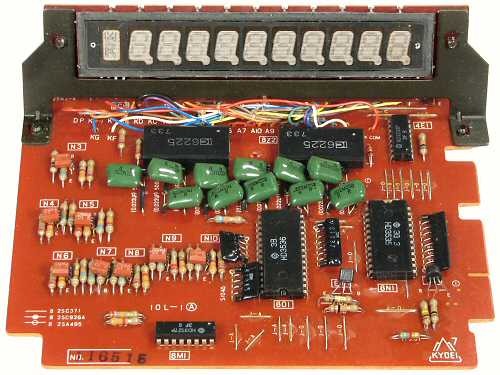 The circuitry is still based on DTL logic, but the 10 large discrete-component boards in the AL-1000 machine have been reduced to just 5 through the use of new general-purpose SSI integrated circuits. Even so, the AL-2000 still contains over 200 discrete transistors, 1000 diodes, 90 SSI chips, two custom MSI (medium-scale integration) chips, and a 512-bit magnetic core memory. A detailed description of the construction, operation, and programming of the Casio AL-2000 is available in the Technical Section. 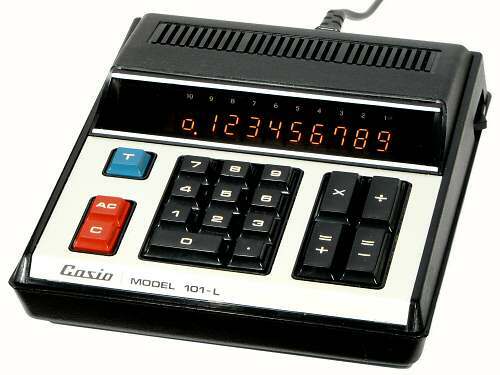 Manufactured: Casio, Japan, late 1970. 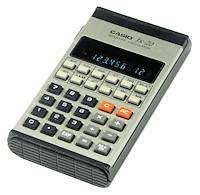 The Casio 121-K is a basic 4-function desk calculator with a constant function and provision for the accumulation of products. 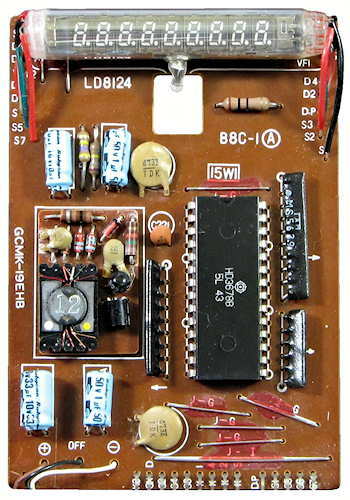 The circuitry uses early MOS-LSI technology with 4 main 40-pin chips (numbered SL35021 to 24, with date codes in December 1970), a dozen support chips from Hitachi and NEC, and numerous discrete components on two large double-sided boards. The boards are permanently interconnected by 53 hand-soldered wire loops. 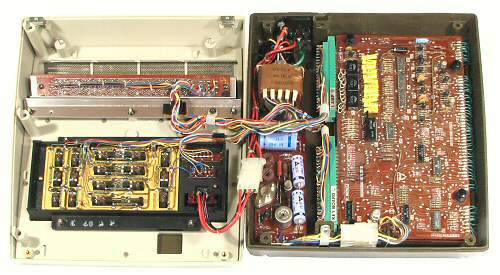 The internal view shows the main boards in the base of the machine, with plug-and-socket connections to the power supply, keyboard and display. (The processor board with the 4 LSI chips is hidden under the display driver board). The keyboard uses glass reed switches operated by moving magnets on the ends of the keystems, while the display uses miniature multiplexed Nixie tubes (Hitachi CD-71). 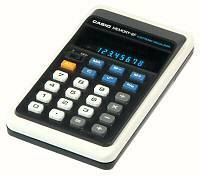 The Casio AS-8S is a compact 4-function desk calculator based on a single MOS-LSI processor chip (the Hitachi HD3272). The display uses the new vacuum fluorescent tubes instead of the previous gas-discharge (Nixie) tubes. The circuitry drives all 8 segments of the DG-10FL tubes to produce well-formed numerals with a "proper" crossed 4. The keyboard uses sealed glass reed switches. There is a Constant switch, and a slider to select 0, 2, 4, or floating decimals. 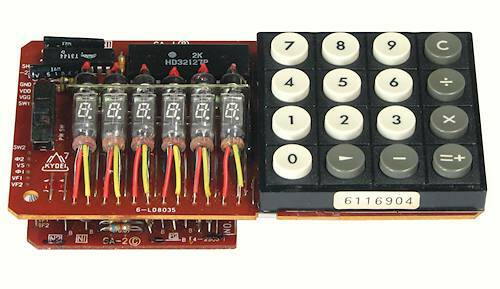 The calculator can be powered from an internal mains supply or from six disposable C-size batteries. The circuitry draws only 700mW, giving about 24 hours calculating from the carbon-zinc cells of the time. The padded carrying case has a removable lid so that the calculator can be used while still housed in the lower section. The instruction manual is printed in English, German, and French. 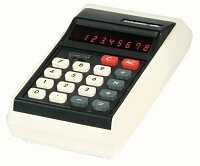 Model 101-L is a mains-powered four-function desk calculator with 10-digit capacity. The individual display tubes have been replaced with a single seven-segment gas discharge panel similar to the Burroughs Panaplex. Addition and subtraction operate in calculator fashion, with the display showing the running total after each operation. Multiplication and division operate algebraically. The machine has a single memory register which automatically accumulates the results of successive multiplications and divisions. The total can be retrieved (and re-used) with the blue T key. The memory register is not directly accessible, although intermediate results can sometimes be stored by multiplying them by 1. The circuitry of the 101-L uses two Hitachi processor chips (HD3535 and 36), two support chips, and two IC6225 high-voltage driver modules for the display panel. 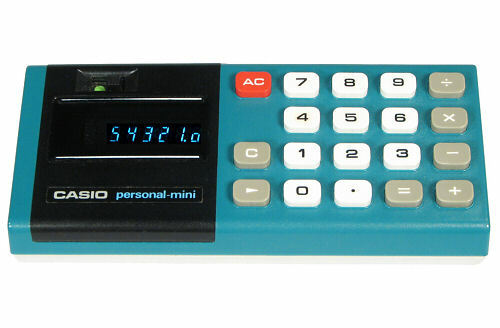 The "Mini" from 1972 was Casio's first low-cost portable calculator. It was a very basic four-function machine, somewhat larger than "pocket" size, but provided with a carrying strap and a soft zip-up case. The Mini progressed through many different versions, and was built in great quantity over a period of about 5 years. This original 1972 Mini has a shiftable 6-digit display using individual individual 7-segment fluorescent display tubes from NEC (LD-8035). These tiny tubes are only 7mm diameter, with 12 connecting leads extending through the base. The numerals are only 5mm high, and are widely spaced on 8mm centres. 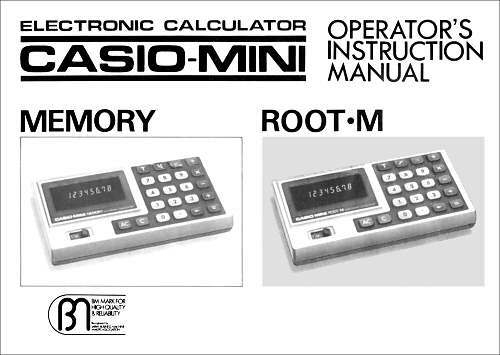 In common with most mechanical calculators of the time, the Mini has no decimal point key, and accepts inputs in whole numbers only. However, it will multiply and divide six-digit numbers to produce up to 12-digit results with an implied decimal point. For example, 2 Div 3 produces 0 in the main display, and 666666 when the shift key is pressed. (The display tubes do have a decimal point, and also an eighth segment at the centre right for a proper crossed 4, but neither are used in this machine). 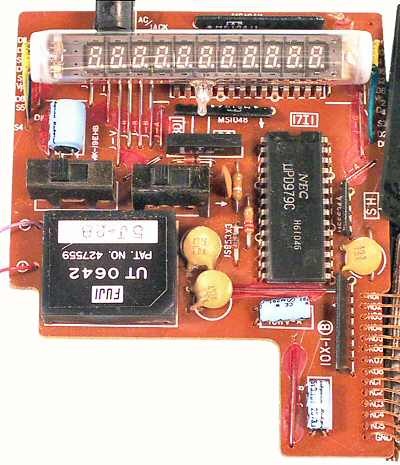 The Hitachi HD32127 processor, display tubes, and keyboard are mounted on a single-sided board measuring 135x70mm, with the power supply inverter on a separate board underneath. Power consumption is rated at 850mW from 4 AA batteries, but in practice is only about 400mW. This CM-602 Mini from 1973 uses a single multi-digit display tube instead of the earlier individual tubes, so that the numerals are much closer together. The calculator retains the shiftable 6/12-digit display but adds a switch to select 0 or 2 fixed decimal places. With the switch on the 0 setting the keyboard and primary display are restricted to whole numbers only. Products beyond 6 digits and decimal results from quotients are available via the shift key. With the switch on the 2 setting the primary display shows a fixed format with 4 integers and 2 decimal places. Further decimals are available via the shift key. Results greater than 9999 result in over-range and lock the keyboard until cleared. The circuitry uses a single Hitachi HD32154 processor and a miniature 6-digit fluorescent display tube from ISE (DP60A). Power is from 4 AA batteries or an external AC adapter (AD-4145), with consumption rated at 500mW. The CM-603 Mini from later in 1973 uses the same case and keyboard as the CM-602 (above), but has floating rather than fixed decimal operation. Entries are limited to 6 digits, but products up to 12 digits can be calculated and displayed with the shift key. Quotients are calculated to the maximum possible, depending on the number of leading zeros. Double-length results can be re-used in further calculations provided that the decimal point is in the primary (most significant) group. The CM-603 circuitry uses a single NEC μPD177C processor and a miniature 6-digit fluorescent display tube (NEC LD-8084). Power is from 4 AA batteries or an external AC adapter (AD-4145), with consumption rated at 540mW. 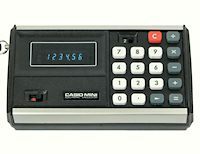 The Casio 8E from 1973 is an unusual entrant in the Casio line-up, in that it uses an American processor and a red light-emitting diode (LED) display. 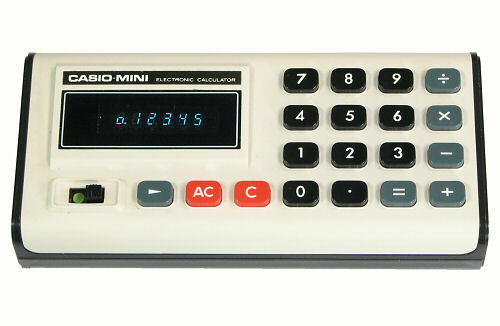 The calculator is similar in size to the Mini, but is arranged in the vertical rather than horizontal format. Operation is basic but quite conventional. The 8E calculator uses one of the first single-chip processors from Texas Instruments in America (the TMS0101 from early 1972), with 17 discrete transistors to drive the individual LED display modules. Power is supplied from 4 AA batteries or an external AC adapter (AD-4145), via an inverter system on a separate circuit board. Consumption varies from 660mW when displaying a single zero to almost 1100mW with a display of all eights. Casio produced only a couple of models of LED calculators, as their (initially) high cost and high power consumption made them an unsatisfactory choice for low-end portable devices. The Mini range continued in 1974 with Model CM-604. The re-styled case is slightly thinner than the CM-603, with rounded edges instead of the metal trim. 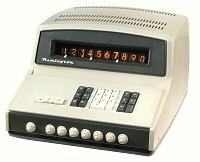 The shiftable 6/12-digit display provides floating-point and limited double-precision operation similar to the CM-603. The CM-604 uses a single HD32170AP processor from Hitachi and a 6-digit LD8109 display tube from NEC. 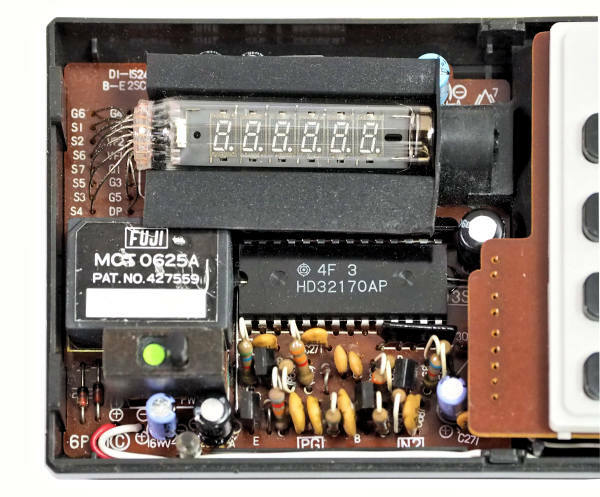 The use of a pre-packaged power supply module (MOT 0625A from Fuji) allows the whole of the electronics to be mounted on a single circuit board about 70mm square. Power consumption has been reduced to 50 mA or 300mW from 4 AA batteries or an optional AC adapter AD-4145. 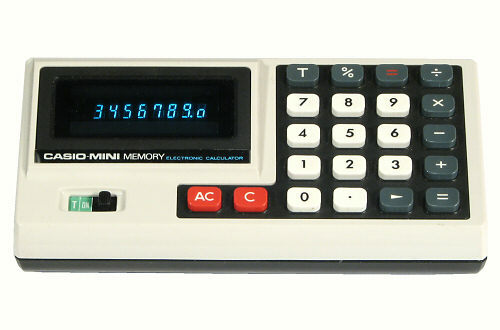 This "Mini Memory" is a more elaborate calculator with memory and percent functions and a shiftable 8/16-digit display. Entries are limited to 8 digits, but products up to 16 digits can be calculated and displayed with the shift key. Quotients are calculated to a maximum of 8 significant figures, depending on the number of leading zeros. Double-length results can be re-used in further calculations provided that the decimal point is in the primary (most significant) group. 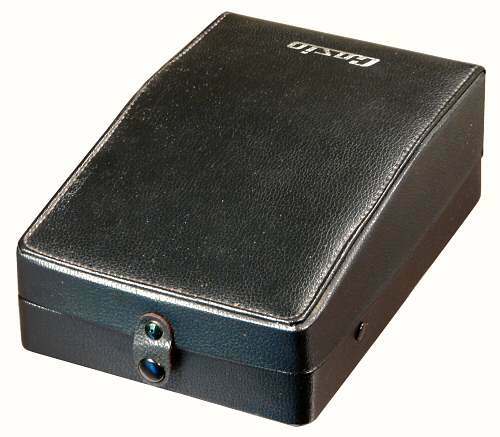 The "memory" function extends the automatic accumulation from the Model 101-L (above) to provide direct memory access and temporary storage without requiring any additional function keys. When the memory is enabled by setting the power switch to the "T" position, the "Equals" key also functions as "M+" and adds the result (or the immediately preceding entry) to the memory. The contents can be retrieved and re-used with the "T" key, or cleared with "AC". The processor and double-ended display tube are both made by NEC (μPD176C and LD-8105 respectively). The calculator draws only 230mW from 4 AA batteries. 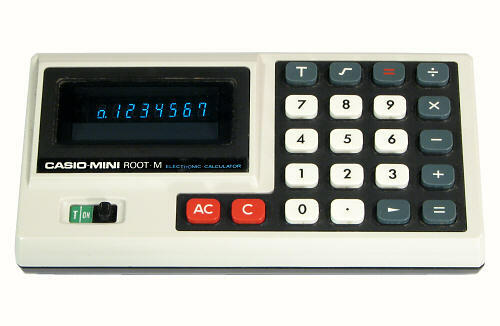 The Mini Root-M has a square root key instead of a percentage key, but is otherwise outwardly and functionally identical to the Mini Memory (above). The two machines even share a common instruction booklet. Internally, this Root-M uses a Hitachi HD-3654 processor and a NEC LD8103 display tube. 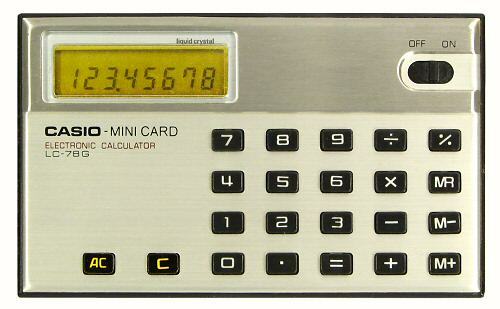 The CM-605 is another version of the basic 6/12-digit Mini in a re-designed and signficantly smaller case. The μPD178C processor and the LD-8097 display tube are both from NEC. The calculator still requires 4 AA batteries, but the power consumption is further reduced to only 180mW. 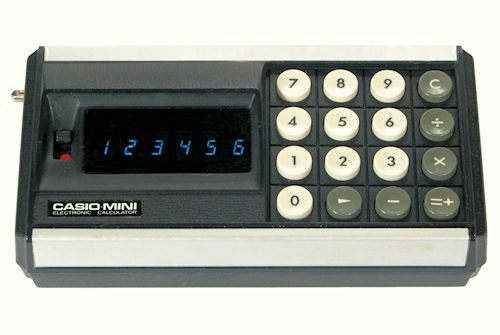 This "Personal Mini" from 1975 is thinner again, and uses only two AA batteries. The processor is the same μPD178C as in the CM-605 above, but the display tube is a NEC LD-8109. 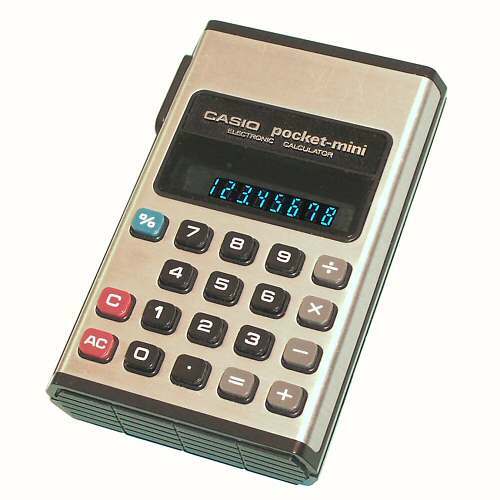 The "Pocket Mini", also released in 1975, is smaller and lighter again. It has a conventional (non-scrolling) 8-digit display and includes a percent function. The processor is a HD-3679 from Hitachi, and the double-ended display tube is an LD-8128 from NEC. The calculator draws a maximum of 200mW from 2 AA batteries. 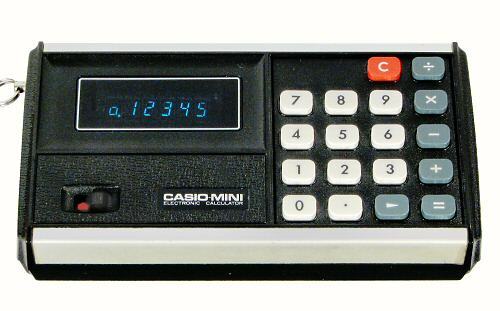 Casio machines were distributed in Australia by Remington, and often carried a stick-on Remington label. This calculator is obviously a variant ot the Casio "Pocket Mini" above, but is branded Sperry-Remington and has no mention of Casio. The casing has been lengthened by 2mm to provide a power inlet socket on the lower left side, but the construction is otherwise identical to the Pocket Mini. The calculator retains the percent function, and adds a single memory which automatically accumulates the results whenever the Equals key is pressed. The total is retrieved with the blue MR key, in a similar manner to the Model 101-L above. The processor is a HD-3691 from Hitachi, and the double-ended display tube is a Toshiba E6537. The Memory-8R from 1975 has exactly the same keys and functions as the Sperry-Remington 1125M above. It uses the same Hitachi HD-3691 processor and a very similar Toshiba E6535 display tube. The horizontal-format case is only 17mm high at the front, and 21mm at the rear. The calculator draws about 200mW from 2 AA batteries. 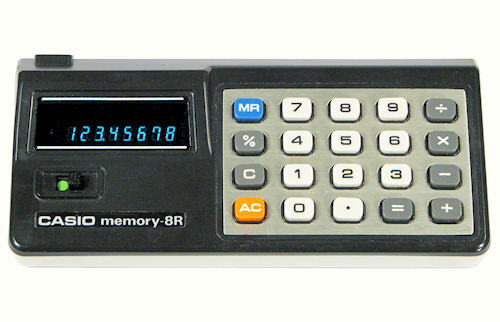 The Memory-8F from around 1975 includes percent and square root functions, and provides a single directly-accessible memory with the now-conventional M+, M-, and MR keys. A switch selects floating point operation, or 2 fixed decimal places with 5/4 roundoff. The uPD977C processor and LD-8120B display tube are both from NEC. The calculator draws about 200mW from 2 AA batteries. 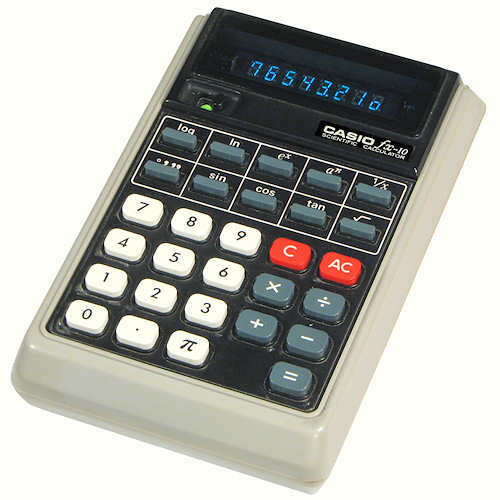 The FX-10 from early 1974 was Casio's first "scientific" calculator. It provides natural logs and inverses, base-10 logs with no inverses, and powers for integer exponents from 0 to 9 only. Trig functions operate in degrees, but there are no inverses. Other keys give reciprocals, square roots, pi, and degree-minute-second conversions. There are no memory functions. The calculator does not use scientific notation, but operates with a floating decimal point within the 8-digit range of the display. The trig functions return only five figures, and take about two seconds. 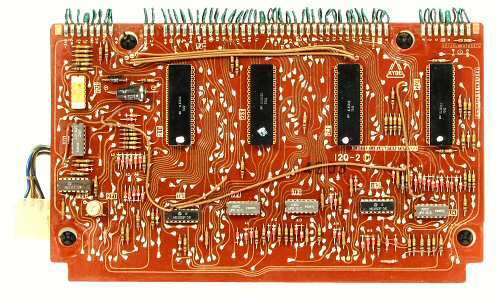 The circuitry uses a pair of NEC processor chips (μPD175C and 179C) and a Toshiba T3086D metal-can chip. The display is a Toshiba E6525 double-ended fluorescent tube with the exhaust tip at the right-hand end. The display driver generates "half-height" zeroes. The calculator draws 80-90mA (about 450mW) from 4 AA batteries or an external AC adaptor (AD-4145). 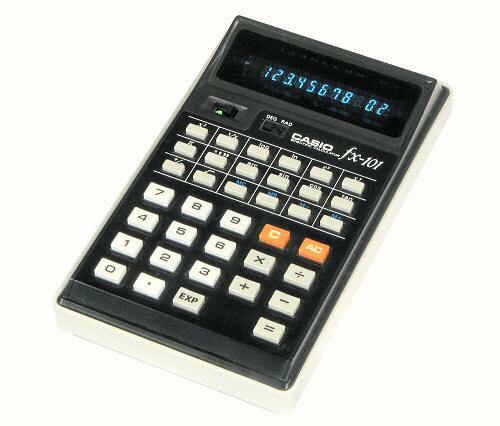 Model FX-20 from 1975 is a more complex scientific calculator with exponential notation. The 9-digit display shows 8 significant digits in floating-point mode, or 6 digits with a two-digit exponent in scientific mode. 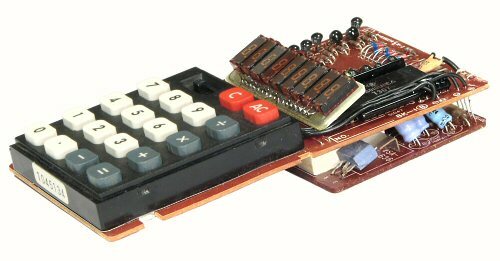 The calculator provides trig functions and their inverses, logs, powers and roots, and a directly-accessible memory register. The trig functions operate in degrees only, returning 6 significant figures in about half a second. The external design is similar to that of the "Pocket Mini" above. 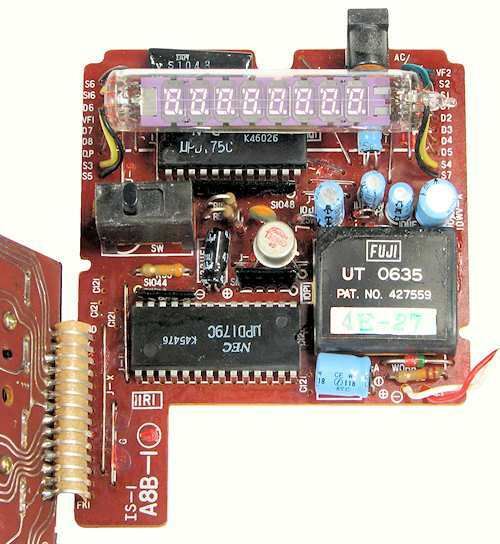 The circuitry uses a single Hitachi HD3678B processor chip, with a 9-digit fluorescent display tube (NEC LD-8124). 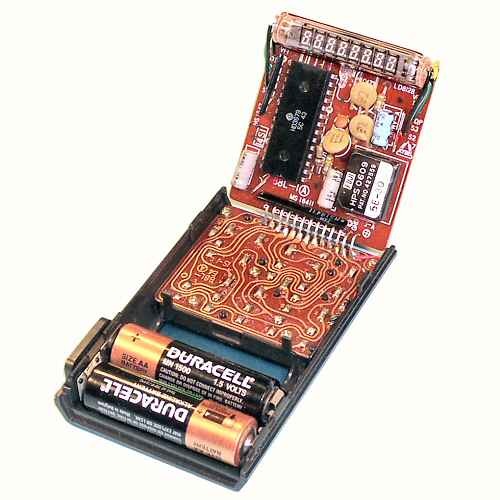 The calculator draws 60 to 80mA (240mW maximum) from 2 AA batteries or an external AC adaptor (AD-2S). Model FX-101 from 1976 extends the functions of the FX-20 (above) with greater accuracy, an 8+2-digit fluorescent display, and additional keys for squares, powers, reciprocals, M-, and π. A slider switch selects degrees or radians for the trig functions. 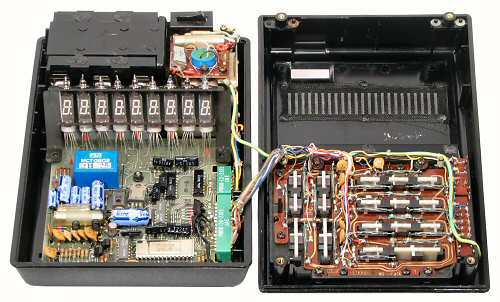 The circuitry uses a pair of NEC processor chips (μPD975C and 979C) in 28-pin packs, and an 11-digit double-ended display tube (NEC LD-8126). The calculator draws a maximum of 450mW from 4 AA batteries or an external AC adaptor (AD-4145). The FX-39 from 1981 extends the functions of the FX-101 above to provide trig functions in grads, hyperbolic functions, and basic statistics (sums, means, and standard deviations). The algebraic entry has been extended to six levels of parentheses. Results in scientific notation are limited to six figures with a 2-digit exponent. 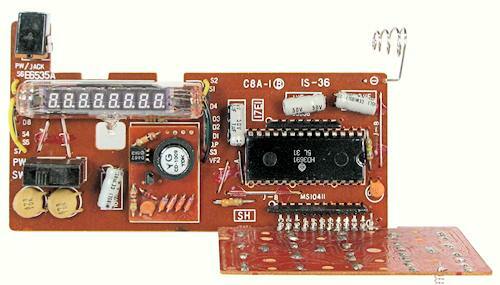 The circuitry uses a single Hitachi HD38111A processor chip and a 9-digit double-ended display tube (NEC FIP-9D5). Power is supplied from two AA batteries or an optional NiCad battery pack NP-2M, with the same AD-4145 AC adaptor/charger as the FX-101 above. Power consumption is about 240mW, although the nameplate rating is 750mW (presumably to allow for charging the optional NiCad battery). 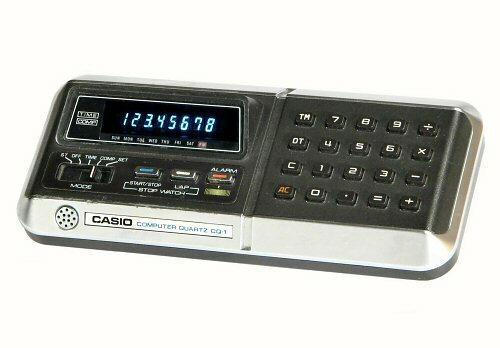 Casio's first venture into electronic timekeeping was the "Casiotron" electronic wristwatch in late 1974. 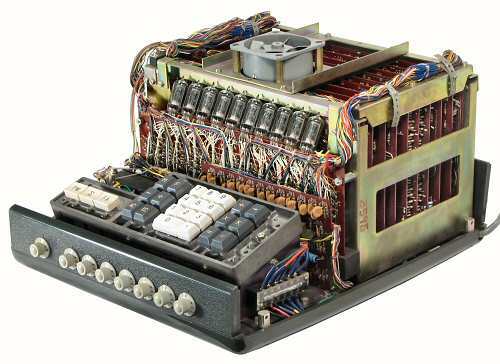 Two years later they produced the "Computer Quartz" CQ-1 - a combination alarm clock, stopwatch, and four-function calculator. The CQ-1 is similar in size to the Personal Mini, but has a much more stylish and expensive-looking case. 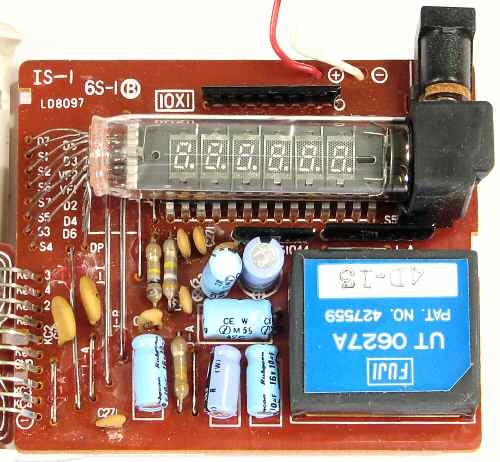 The calculator and the 8-digit fluorescent display are powered from a single AA battery. The timekeeping circuitry is powered separately by two SR-44 silver-oxide batteries. 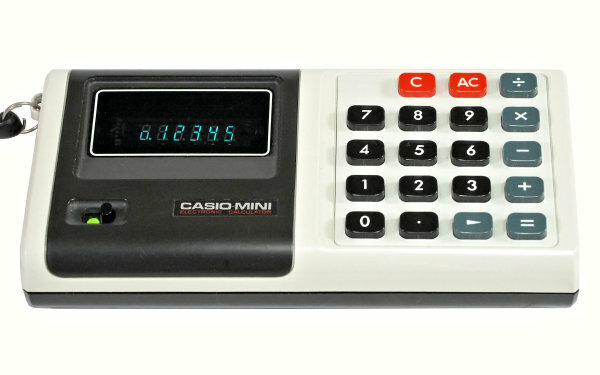 Casio introduced the first "credit card" calculator, the LC-78, in January of 1978. The circuitry consists of a single IC chip, an 8-digit liquid crystal display, and an elastomeric keyboard, with no additional components. The calculator draws only 0.6mW from two silver-oxide batteries. The LC-78G illustrated was given away as a promotional aid by a Japanese machine tool manufacturer. 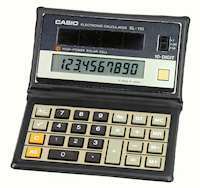 The Casio SL-110 from 1984 is a 10-digit LCD calculator which requires no batteries at all. The calculator is housed in a folding plastic wallet, with a "High-Power Solar Cell" in the upper section. The cell generates sufficient power to operate the calculator quite satisfactorily in dim room lighting. The SL-110 includes percentage and square root functions and a single memory regster. Results of successive multiplications and divisions are automatically accumulated in a separate "Grand Total" register and are retrieved via the "GT" key. A small slider switch selects a full floating-point display, or a display with only two decimal places and either 5/4 roundoff or truncation. The history and philosophy of the Casio company is covered in more detail on the Casio corporate web site. 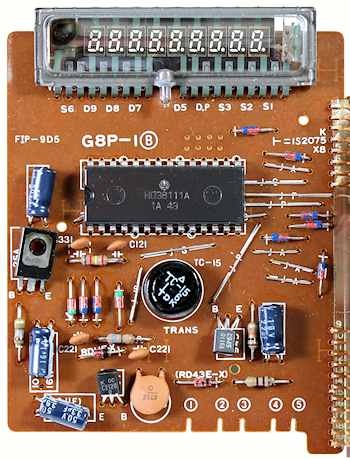 A description of the construction, operation, and programming of the Casio AL-2000 is available in the Technical Section. Original text and images Copyright © John Wolff 2009-18. Use at own risk; beware of errors; suggestions for improvement welcome. Last Updated: 18 December 2018 - added CM-604.